While Nokia wouldn't invite us to Nokia World this year, we were fortunate enough to discover a pair of its new X6 handsets on the IFA floor here in Berlin. On hand were two engineering prototypes, one of which was peeling away from its plastic shell while the other seemed less responsive to our finger-taps. 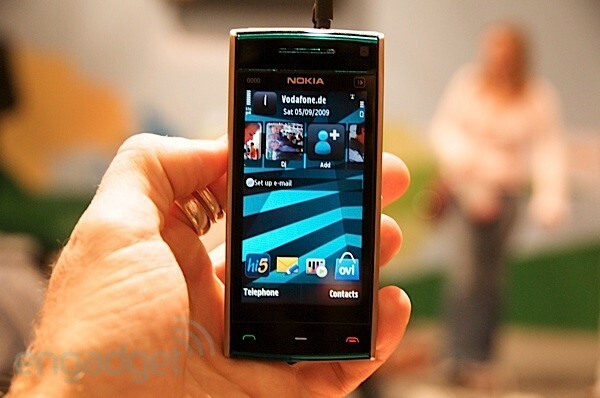 Still, it's clear that the capacitive touchscreen is far more responsive to human touch than the resistive screens found on its N97, or the 5800 XpressMusic especially. This was made abundantly clear when using the on-screen keyboard although some of our swiping gestures were inexplicably ignored in other elements of the interface. But given the choice of the screen being awesome or super-awesome (remember, we're comparing it to Nokia's resistive touchscreen legacy), we'll have to settle on the former for now. Of course, underneath you've still got S60 5th, for better or worse, pumping away inside a chubby little candybar -- no screen tech can change that. See the action in the video after the break then jump into the gallery to see it sized up with a few of its S60 cousins five times removed. Nokia X6 video hands-on: proof that capacitive touchscreens are better originally appeared on Engadget Mobile on Sat, 05 Sep 2009 09:54:00 EST. Please see our terms for use of feeds.